Association analyses of resistance to Rhynchosporium commune in a collection of European spring barley germplasm detected 17 significant resistance quantitative trait loci. The most significant association was confirmed as Rrs1. Rhynchosporium commune is a fungal pathogen of barley which causes a highly destructive and economically important disease known as rhynchosporium. Genome-wide association mapping was used to investigate the genetic control of host resistance to R. commune in a collection of predominantly European spring barley accessions. 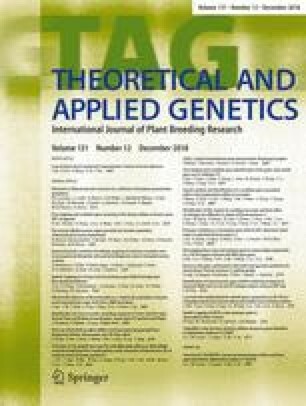 Multi-year disease nursery field trials revealed 8 significant resistance quantitative trait loci (QTL), whilst a separate association mapping analysis using historical data from UK national and recommended list trials identified 9 significant associations. The most significant association identified in both current and historical data sources, collocated with the known position of the major resistance gene Rrs1. Seedling assays with R. commune single-spore isolates expressing the corresponding avirulence protein NIP1 confirmed that this locus is Rrs1. These results highlight the significant and continuing contribution of Rrs1 to host resistance in current elite spring barley germplasm. Varietal height was shown to be negatively correlated with disease severity, and a resistance QTL was identified that co-localised with the semi-dwarfing gene sdw1, previously shown to contribute to disease escape. The remaining QTL represent novel resistances that are present within European spring barley accessions. Associated markers to Rrs1 and other resistance loci, identified in this study, represent a set of tools that can be exploited by breeders for the sustainable deployment of varietal resistance in new cultivars. The online version of this article ( https://doi.org/10.1007/s00122-018-3168-5) contains supplementary material, which is available to authorized users. We thank the IMPROMALT consortium for making the germplasm collection as well as the genotypic and historical phenotypic data available for this study and the BSPB and the AHDB Cereals and Oilseeds division for the provision of the National and Recommended List data. We also thank Richard Keith, Chris Warden, Dave Guy and Alfred Barth for all their technical help in this work. This work was funded by the Scottish Government Rural and Environment Science and Analytical Services (RESAS) and the Bavarian State Ministry of Food, Agriculture and Forestry and the BMBF under Grant-no 031B0199D. MEL and WTBT were also funded by the BBSRC IMPROMALT project BB/J019593/1. LLG was funded by the BBSRC training Grant (BB/K501906/1). AA was also funded by the BBSRC-CIRC project BB/J019569/1.